With the MA Conservation Summer Show fast approaching, we got in touch with some of our recent graduates and alumni to ask them about their life after graduation and their current projects. 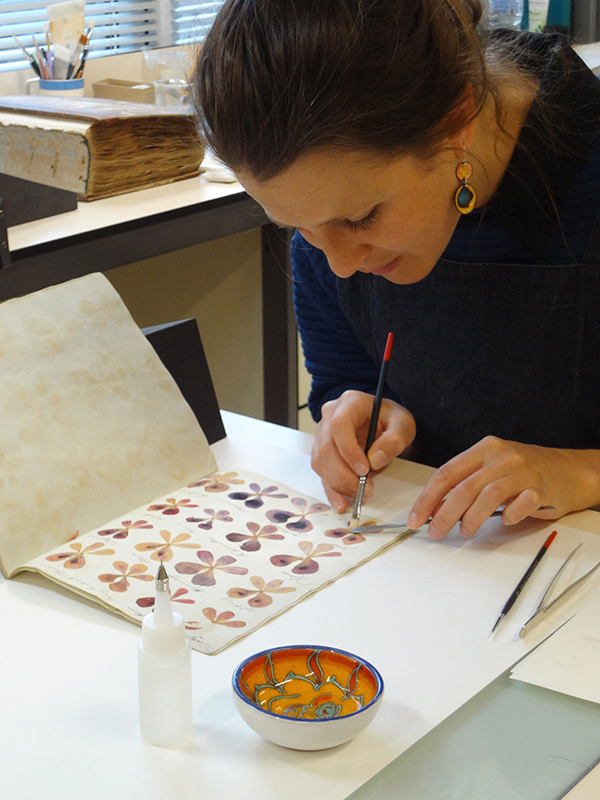 First in line is alumna Sarai Vardi who have been working as a book conservator at the Royal Botanic Gardens, Kew since 2014. Sarai was born in Israel and moved to Scotland when she was five years old, growing up in Edinburgh and then Perthshire. Later, she moved to London to study BA Illustration and Animation, working in the city in various jobs for a couple years before she joint the MA Conservation course at Camberwell. 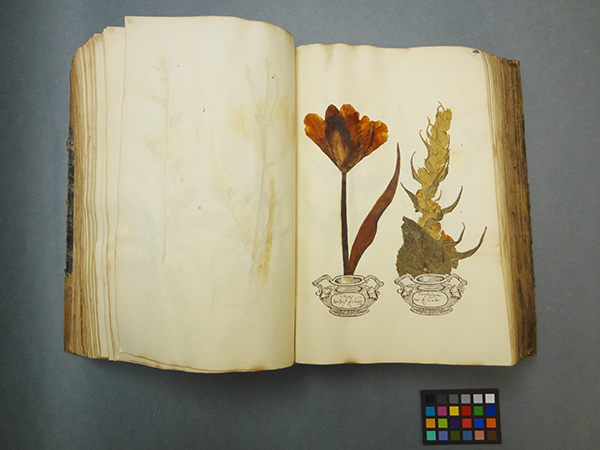 Conservation work by Sarai Vardi for the Royal Botanic Gardens, Kew. After graduating, I had a one year internship at the Leather Conservation Centre, working on the conservation of historic books and archives. I learnt all about leather production and how to conserve historic leather objects, including conserving the upholstery of a range vintage cars. A highlight was working on an early Landrover belonging to the Queen; she travelled in it during her first tour of the Commonwealth. 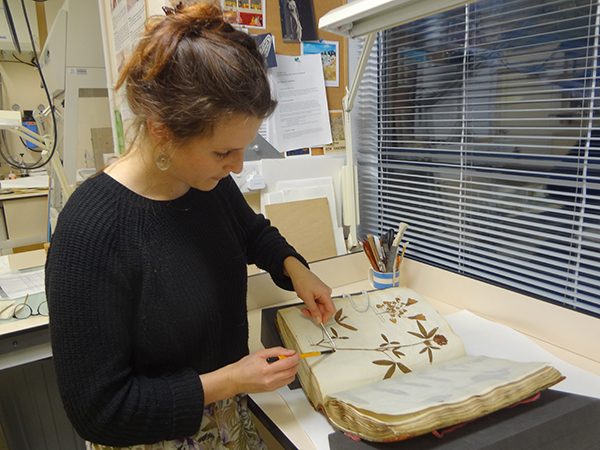 Since 2014, I have worked as a book conservator at the Royal Botanic Gardens, Kew. 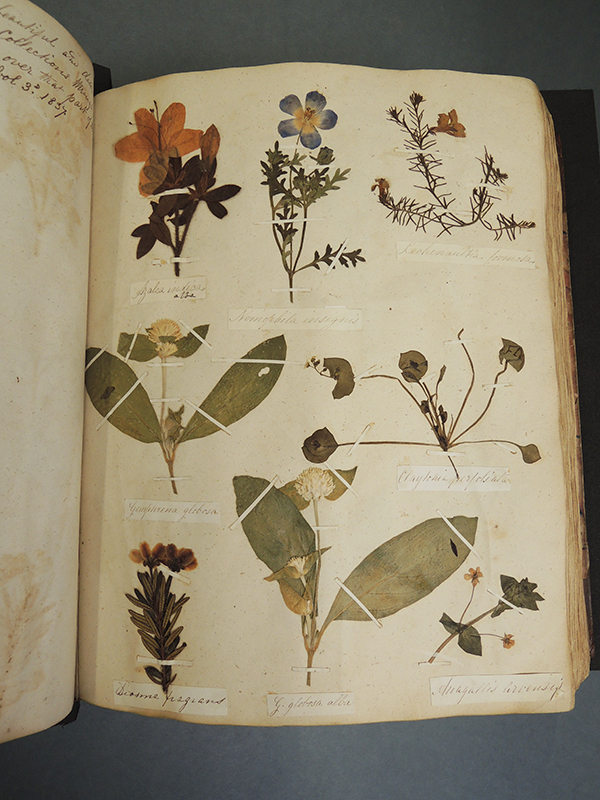 Initially, I carried out a project to conserve Kew’s collection of books which contain pressed plants, mounted to the pages. This was really interesting because I got to train in the conservation of botanical material, something I never thought I would do. I have also been involved in a committee which is part of the UK Institution of Conservation, where I helped to organise an international conference on the influence of East Asian materials and techniques in Western paper conservation. I am still working at the Royal Botanic Gardens, Kew and most recently I have been treating a collection of oil paintings on paper, as well as assisting with exhibition preparation (condition checking, conserving, mounting and framing) for artwork that is going up in the gallery in Kew Gardens. I am also conserving some of the more precious books from Kew’s Library, Art and Archive Special Collection. I loved my time at Camberwell, the MA was full on, but in an enriching way. The teaching was of a high standard and I really felt the tutors cared about us. Also, studying in London means that so many incredible institutions and historic collections are right on your doorstep. I tried to make the most of that, and was lucky enough to carry out student work placements in the conservation studios of some really great institutions such as the Wellcome Trust, the V&A and the College of Arms, during my two years at Camberwell. It was on these placements that I could put the theory I learnt into practice, by working on actual heritage collection items. Studying on a vocational course was great because it kept me focused. Everything I learnt at college, I have put to use in my working life. I’m still in touch with my lecturers which is nice, and I even have a Camberwell MA Conservation student volunteering with me at Kew now, so it feels like I’ve come full circle. What tips would you give a student starting out at Camberwell? Make the most of the college facilities, interact with students on other disciplines, do as many work placements as you can, come in early, stay late, and travel by bike!